The home department has lodged a satellite war on opium dens. Armed with guide maps provided by remote sensing satellites, it is planning a crackdown on illegal poppy fields across 11 districts, including Sahebganj and Pakur. Confidential letters, detailing the action plan, has already been rushed to police chiefs of all the concerned districts. It is learnt that the letters shed light on fringe areas — demarcated by satellite pictures — where illegal cultivation of poppy is rampant. An intelligence officer, not willing to be named, said the districts of Sahebganj and Pakur hosted acres of poppy fields. "Last year, raids were conducted at a few places and poppy worth crores destroyed," he said. "But the problem could not be exterminated." 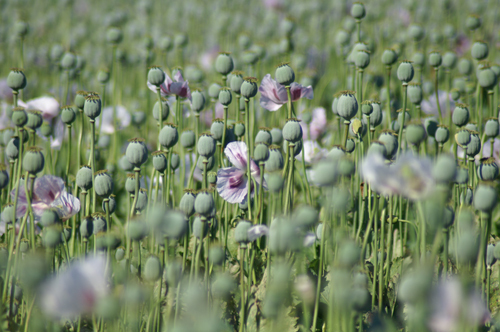 Interestingly, "outsiders" — mostly Bangladeshi drug peddlers —lure local peasants into illegal cultivation of poppy. "A drug merchant makes capital investment and also buys the produce from the poor farmer whose profit goes up to several thousands of rupees. The lure of the lucre is hard to resist — you invest little and earn a handsome profit," the officer said. The poppy pods are processed in Bangladesh. The druglords, who buy poppy from farmers in Sahebganj and Pakur, sell it in the international market at a much higher price. Besides these outsiders, Naxalite groups also indulge in the business for money to fund their organisations. The market price of poppy pod varies from time to time. A single, mature pod can fetch anything between Rs 90 and Rs 130. Half-grown pods are sold at Rs 500-700 per bhari (about 10gm). Poppy milk, a gum like substance that is processed into opium, is sold at Rs 1,500-3,000 per bhari in the local market. The price in the international market is thrice, if not more. The satellite watch has been spurred by recent reports prepared by the central economic intelligence bureau suggesting revenue loss of several crores because of illegal poppy cultivation. No official was ready to go on record with the exact figure. "You can imagine the loss to the state exchequer if you consider the price of opium ingredients," an intelligence official said. Earlier, under the chairmanship of state home secretary J Tubid, district-level teams were constituted to counter the alarming rise in such activities. The committees comprise superintendents of police, district forest officers, district public prosecutors, representatives of district-level excise department, representatives of district-level special branch officers, representatives of district-level crime investigating bureau and district public relation officers. The deputy commissioners can nominate anyone in the committee. The teams have been asked to identify poppy fields in their respective districts and destroy them. Now, the satellite maps will come in handy. A nodal officer has also been deputed in each district to co-ordinate between the state and police headquarters. A slew of other measures, such as awareness campaigns and rewards for information on opium dealers, have also been initiated to check the growing menace. Sahebganj superintendent of police confirmed that they had received the guide maps and would take action accordingly. Sources in his office said raids were being planned in Rajmahal, Barharwa, Taljhari and Maharajpur. Pictures taken by remote sensing satellites show large-scale cultivation in these areas.